I sold my car last week and am loving being car free in L.A. It is one of the most liberating things I've ever done. But there are times when walking, biking or taking public transit just won't work and a car is a necessary evil. Well, tonight I became a member of the Zipcar vehicle sharing program. It costs only $50 for annual membership dues plus a $25 activation fee for the occasional driver subscription. The first 180 miles are free and gas is always free with the gas card they provide you. And you can keep the car for up to 4 days. If you need to keep it longer you can request an extension by calling Zipcar. The membership comes with insurance plus for an extra annual fee of $75 you can waive the $500 damage fee if you get in an accident and it is your fault or nobody's fault. Also, you can sign up for text messages telling you timely information about your reservation such as how much time is left and where to drop off the car. Zipcar is an eco-friendly company and is going electric which is an incredibly exciting development. Recently, Ford and Toyota have been interested in using Zipcar members to test electric vehicles and car sharing vehicles. 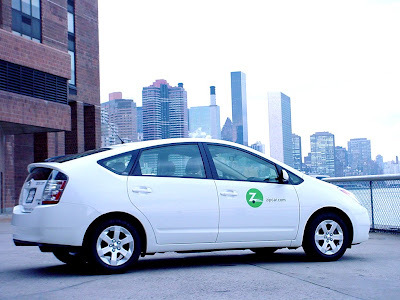 Early last year a pilot program was launched between Zipcar and the City of San Fransisco to promote plug-in hybrids in Zipcar's fleet. The primary vehicle used is the Toyota Prius converted to a plug-in electric hybrid that recharges at stations across the Bay Area. Now that I have a Zipcar membership I hope they extend this plug-in hybrid program to Los Angeles.